IS ONE OF THE MANTRAS WE LIVE BY AT THE GREAT BRITISH CAFE. A NICE FULL BELLY WILL ALWAYS PUT A SMILE ON YOUR FACE, BUT LET’S BE HONEST: SOMETIMES YOU DON’T HAVE TIME TO GRAB PROPER FOOD, AND THEN YOU END UP HANGRY A COUPLE OF HOURS LATER. So next time why not utilise our epic take away service and make sure you’re well-nourished 24/7. Polo bar offer our full menu whenever you need it through Hungry House, Deliveroo and Feast. Or call the café on 020 7283 4889. Don’t delay, simply hop over to the booking page; place your order and our chefs will whip you up some delicious London-style nourishment! Did you know that you can pre-order your favourite polo bar dish so it is ready for you to enjoy when you arrive at the cafe? We know pretty cool right! We are the only 24 hour café licensed in the City of London to offer breakfast, lunch or dinner. Just makes your life that bit easier. Simply email us your order or call us on 020 7283 4889. If you’re a frequent customer why not plan ahead and use our new re-occurring order and delivery service? So next time why not utilise our epic take away service and make sure your well-nourished 24/7. Polo bar offer our full menu whenever you need it through Hungry House, Deliveroo and Feast. Or call the café on 020 7283 4889. Being British you know what a pain it is to queue. But at Polo Bar we are always striving to make your life easier and your belly fuller. We understand that being a Londoner you don’t always have time to wait around. Based outside Liverpool Street station life moves fast and we are here 24 hours a day seven days a week serving up Great British café fare for you to collect and get you on your merry way as quick as possible. POLO BAR DELIVERY. THE CITY NEVER STOPS, SO WHY SHOULD YOU? From kangaroos on scooters to flying food comets, Polo Bar is embracing technology and services to help you enjoy the full menu from the comfort of your home or in the sanctuary of your City office. 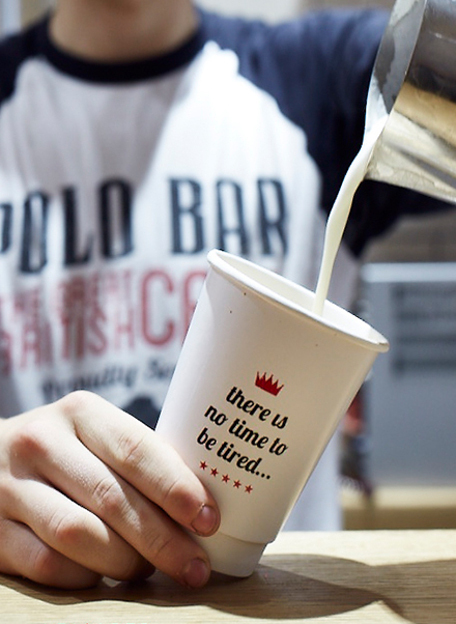 Whether you are trying to hit an impossible deadline or simply can’t be bothered to cook let Polo Bar step up and deliver some Great British grub to your door. You can order through Deliveroo, Hungry House and Feast. NOT A FAN OF APPS? If you’d rather go direct and talk to the kitchen you can use the form below to place your take away order or call the Great British café on 020 7283 4889 and we’ll get straight to work.